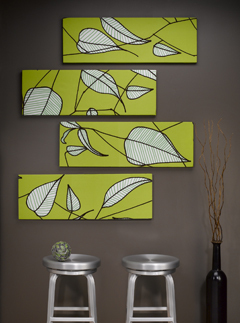 Using a leafy design fabric print you can take plain ordinary wall art and turn it into a great focal point in any room. This is a great spring decorative piece. Find this project and many more low-cost decorating ideas in the great decor in a flash without a lot of cash eBook from Dow. For more great wall decorating designs, check out 19 Cool Wall Art and Decor Ideas. Cut four 18" x 42" panels from fabric, taking note of desired design placement. Center first foam sheet on back of fabric. Fold fabric around edges down, smoothly mitering corners. Pin fabric to back to secure. Spot glue as necessary. Cover three remaining panels in same way. Use poster adhesive to attach to wall. Or, glue sawtooth hangers to back of each panel; for additional hold, insert and glue two straight pins through holes in sawtooth picture hanger; let dry. To change the look, simply remove pins and repeat Steps 1 and 2 with new fabric.